I remember being at a mid-1990s house party for teachers and artists in Newport News, Virginia. It was during my first full-time gig as a librarian and I was serving informally as dj. With the idea of livening things up a little, I put on a vinyl copy of The Stooges’ Funhouse and cued up “Loose” and “TV Eye,” turning up the volume. In the middle of this grand sonic gesture, a history instructor -- who was deaf in one ear -- turned his working ear into the nearest blasting speaker. Within the first minute, he was jumping back with amazement: “Oh my God! That’s the greatest thing I EVER heard in my WHOLE LIFE!!!! !” He was floored. Though not everyone would have agreed at the time, this was a perfect response. 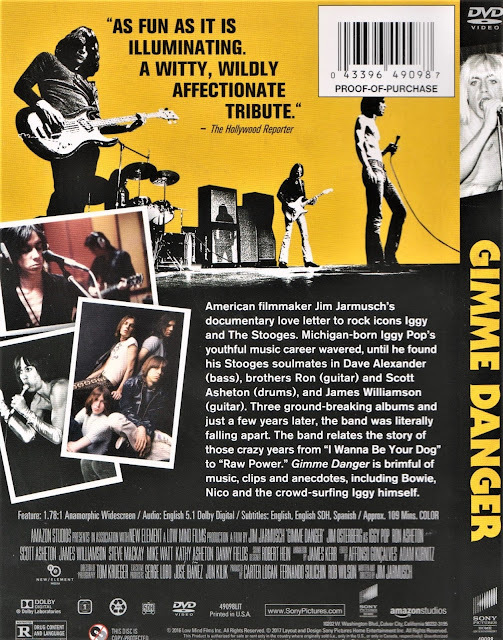 And now, after the induction of The Stooges into the Rock & Roll Hall of Fame in 2010, after the deaths of several of the members of the band, out comes Gimme Danger (2016), “a film by Jim Jarmusch,” “story of the stooges,” Gimme Danger: La historia de The Stooges, Gimme Danger. 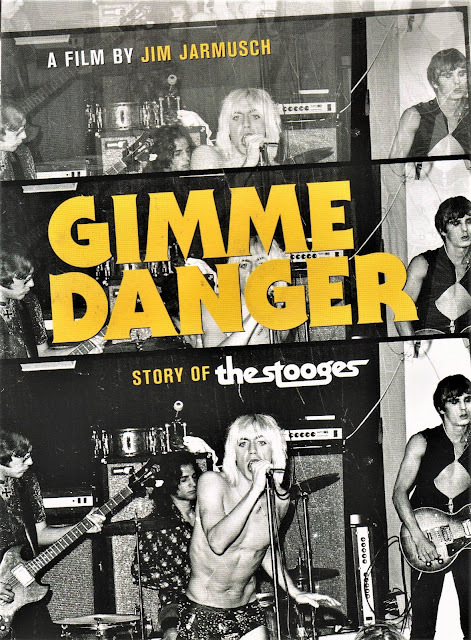 История Игги и The Stooges, a highly entertaining documentary featuring Iggy Pop, the various (then-)surviving band members, and Michigan. Outside of Ann Arbor, he was living in a trailer with his parents (his father was a high school English teacher). He picked up performance ideas from The Howdy Doody Show, Clarabell the Clown (played at one time by Captain Kangaroo), and Soupy Sales (who often had highly influential musicians perform live – including Billie Holiday and Miles Davis). Back in Michigan, Iggy taught Scott Asheton how to pound out the drums. Some of the band members were sons of World War II vets and had that in common. The Asheton brothers took off for an adventure in London and immersed themselves into the Marquee Club until they ran out of money. After the 1967 riots in Detroit, Iggy decided to move into the city. “I’m going to prepare a house where we can live” as “true communists.” He had very little idea of what he was doing, but somehow it worked (eventually). In Detroit, they gestated. “Michigan was a key crossroads between San Francisco and New York.” The members of the band tried various altered states and listened to Harry Partch records that highlighted the sounds and noises of various handmade, found or modified instruments. Iggy preferred not to become overtly political in the way John Sinclair wanted. He did somersaults and wiggled around as a protest. Jac Holzman (who also worked with The Doors) was there and helped make it happen. There weren’t enough songs for an album to begin with, so Iggy and the rest of the band went to the Hotel Chelsea and hurriedly came up with additional songs – twenty-five worlds or less. 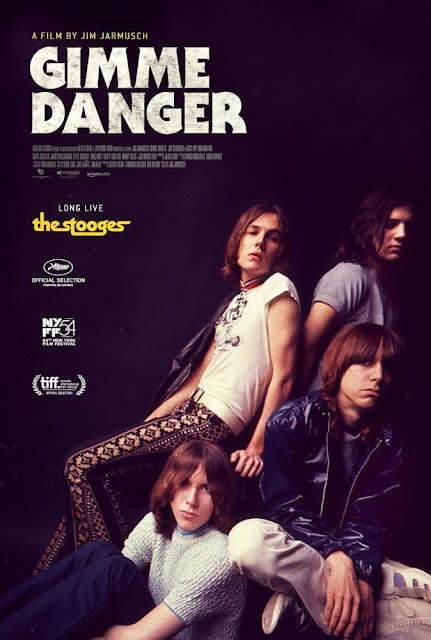 Skipping forward a little, The Stooges are sent to Los Angeles to record 1970. Iggy, being interviewed, notes that much of the “California sound” that came out in the 1970s was manufactured under the guidance of record executives. “It still smells,” he notes, true to his Michigan-style phrasing. “Cultural treason” is what it was. For 1970, Iggy brings in Steve Mackay to lay down some saxophone. He had in mind Miles Davis and James Brown. “Play like Maceo Parker on acid!” Big aural space is there. Iggy walks by a pet store and notices a beautiful dog collar. He buys it and adds it to his persona. The Stooges play the Whiskey a Go Go and blow the mellow minds of Californians. “Theatre of the moment.” The band plays deadpan and still in Bill Wyman style while Iggy prances around, dives into the crowd and acts like James Brown and Mick Jagger on speed. Inspired by the Egyptian pharaohs, he performs shirtless. I could go on, but why? You can dig it for yourself! Gimme Danger. Raw Power. Iggy gets the final say: “I just wanna be.” Amen, brother. I wanna see this. I was not originally a fan of the Stooges but their music has grown on me over the years. I'd like to know more about them.